Stuart's SMP40 melting point apparatus speeds up purity and identification testing by offering automatic, walk-away operation. The unit is available with optional full installation qualification and operation qualification (IQ/OQ) documentation, for regulated laboratories needing to comply with cGMP audit requirements. The SMP40 uses digital video imaging technology to detect and capture accurately the melting point of up to three samples simultaneously. The melt process can be viewed in real time or retrospectively on the full colour 5.7" VGA screen. Maximum footprint flexibility is ensured by the split design so, for example, the sample side of the apparatus can be placed at the back of the bench or even in a fume cupboard, while the control side detects whether it is being used upright or on its side and adjusts the screen orientation accordingly. 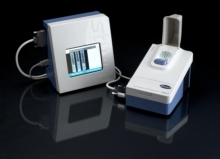 Around 200 results in the form of .avi video files of the melt process can be stored by the SMP40 for viewing on the unit's screen, while USB connectivity enables transfer to a flash drive or PC via Microsoft® ActivSync, facilitating long-term traceability of results.